A VERY SPECIAL OFFER: 25% Loyalty Discount on new 15-volume set to customers who own volumes 1-10 set. The first 10-volume set of this encyclopedia proved to be a milestone for the scientific community working in the field of nanotechnology. Given the tremendous success of the first 10-volumes and fast research development in the different fields of nanoscience and nanotechnology, it was decided to bring new volumes summarizing emerging nanotechnologies over the past several years. 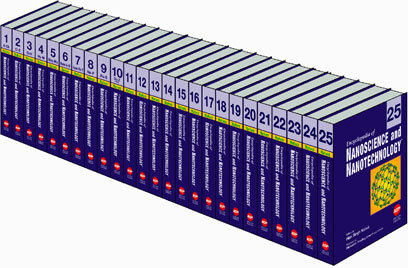 The new 15 volumes contain much longer articles and supplement the best-selling encyclopedia which initially appeared in 2004. The new 15 volumes contain 100% of new state-of-the-art 300 articles organized in an A-Z format, more than 900 contributing authors, 60,000 bibliographic references, 6600 figures, 600 tables and hundreds of equations to provide a complete coverage of advanced research in all nanotechnology related fields such as chemistry, physics, engineering and medical sciences. Encyclopedia of Nanoscience and Nanotechnology is a landmark reference in the continuously emerging field of nanotechnology containing hundreds of descriptive images/figures/illustrations in color for a better representation like earlier 10-volume set published in 2004. The comprehensive coverage of advanced topics in the new 15 volumes reflects emphasis on emerging nanotechnologies. The most expanded, this classic reference is one of the best books in the world. It is the most comprehensive and unique reference with a very broad and wide-ranging coverage in the field of nanotechnology that establishes this encyclopedia apart from other similar types of titles. The first edition of the Encyclopedia of Nanoscience and Nanotechnology, 10-Volume Set, (Edited by H. S. Nalwa, Foreword by Professor Richard E. Smalley, Nobel Prize Laureate, Endorsed by Professor Jean-Marie Lehn, Nobel Prize Laureate) that appeared in 2004 received the "2005 Best Reference Work Award" of the American Society for Engineering Education (USA) and "2005 Outstanding Academic Title" by the CHOICE magazine from the American Library Association (USA). With the addition of new 15 volumes, the entire edition's 25 volumes now contains over 710 review chapters (nearly 300 of which are brand new), contributed by over 2,000 of the world's leading scientists from top-notch academic and industrial institutions worldwide. The 25 volumes of encyclopedia now contains approximately over 700 articles, 150,000 bibliographic citations and thousands of illustrations, figures, tables, and equations covering over 22,000 pages which hundreds of images/figures/illustrations in color. The 25-volume set contains the largest number of state-of-the-art review chapters ever published in the world in the field of nanotechnology. Each chapter is fully cross-referenced, introducing some of the most important nanotechnologies under development today. There is no match for this landmark reference since this encyclopedia covers all research topics reported over the past two decades. It is the most useful reference for all academic and research libraries. The 25 volume set is a landmark reference that contains the largest number of research articles in the world. Comprehensive coverage of all aspects of the nanoscale science and technology in all disciplines of science. Published in both print and online formats. The encyclopedia is intended for a very broad audience working in the fields of nanoscience and nanotechnology having strong connections with materials science, electrical and electronic engineering, solid-state physics, surface science, aerosol technology, chemistry, colloid science, ceramic and chemical engineering, polymer science and engineering, supramolecular science, mechanical engineering, metallurgy and powder technology, optical science and engineering, device engineering, aerospace engineering, computer technology, environmental engineering, bionformatics, biology, pharmacy, biotechnology and food science. This encyclopedia is an invaluable reference source for the libraries in universities and industrial institutions, government and independent institutes, individual research groups and scientists working in the field of nanoscience and nanotechnology. "The Encyclopedia of Nanoscience and Nanotechnology is a remarkable resource for those working in the many diverse fields enabled by nanoscale phenomena. The encyclopedia provides the reader immediate access to topical knowledge of immense breadth and depth. I highly recommend it." "This encyclopedia offers the most current, expanded and thorough coverage of all major research topics in the field of nanotechnology. It is the most comprehensive and valuable reference source for a very wide range of researchers from science to engineering to medicine." "As an innovation for today and tomorrow's world, nanoscale science and technology has the highest possibility of a revolution of our life style by moving its working place from a laboratory to a plant. This Encyclopedia is an unprecedented source by encompassing all aspects of nanoscale related science and engineering. This encyclopedia will help the beginners and experts of nanoscience and nanotechnology to find out the most up-to-date and detailed information and deepen their scientific understanding and thus develop successful engineering applications." The Encyclopedia of Nanoscience and Nanotechnology proves to be a definitive tool that links both the novice and expert researcher to understandable articles and matches the caliber of past recipients of ELD's Best Reference Work Award." "Encyclopedia of Nanoscience and Nanotechnology (10-Volume set) edited by Hari Singh Nalwa has been selected as the CHOICE Outstanding Academic Title." "American Scientific Publisher's Encyclopedia of Nanoscience and Nanotechnology is an excellent scientific encyclopedia. It provides an excellent breath and depth of information that is particularly suited to benefit a broad spectrum of non-professional and professional researchers.......it is an excellent set that should provide sound information for several years to come." "The Encyclopedia of Nanoscience and Nanotechnology is the world's first single most comprehensive reference source ever published in the field of nanotechnology. This encyclopedia is an indispensable source for any research professional as well as for technology investors and developers seeking up-to-date information on the nanotechnology among a wide range of disciplines from science to engineering to medicine. It should inspire future generations of academic and industrial researchers who endeavor to develop new nanoscale materials and devices." "In view of the great interest that Nanoscience and Nanotechnology are attracting, the rapid development they are experiencing and of the profound impact they will have, an Encyclopedia covering this field is most welcome. It should become a source of inspiration as well as of information for a very wide range of scientists."